Let’s set the stage for what we’re discussing. According to the data of the 2016 American Census surrounding disability, about 39 million civilian noninstitutionalized Americans self-report as disabled. That’s 12% of Americans who are out and about and living among us day to day. In 1990 Congress passed the Americans with Disabilities Act (ADA). In short, it is a civil rights law addressing the needs of people with disabilities, prohibiting discrimination in employment, public services, public accommodations, and telecommunications. All state and federal government offices, educational, and healthcare institutions are expected to comply with the law, as is an organization that works with them. So let’s define what a disability is. For most people what comes to mind when disability is mentioned are deafness, blindness and being in a wheel-chair. Although all of those are true, for the purpose of accessibility disability is all those and people with colorblindness, mobility issues, and cognitive difficulties among other things. And it runs the gamut from the person who has had to deal with a disability from the moment they arrived on this planet to the person who is temporarily inconvenienced. So, What is Accessibility and Why Should We Care? In a nutshell, accessibility is altering or creating environments and tools that are easily used or accessed by the disabled population. In the realm of telecommunications that includes websites, social media, videos, and electronic documents. No matter how you do the math 12% of just over 300 million is a fair amount of the population, and those are just the ones that self-reported. That means that there are even more out there that haven’t identified themselves, and some who don’t identify themselves that way. Like who? How about the person who just broke their arm and now they’re in a cast while they heal? Or the person who is suffering from a concussion currently and, although they’re expected to recover, is just having a hard time with colors or reading at the moment? They are disabled for a short time, but they wouldn’t count themselves among the disabled community at large. In any case, though, that is 12% of the population that can’t buy your product, take your course, learn more about your services, or research your organization/company and you miss out on them. Also, did you know that companies like Google will actually give sites that are set up for accessibility higher rankings on searches? The more accessible you are, the better your site will perform. And that’s just the start of the reasons why you would benefit from taking steps toward accessibility. Alt Tag Your Images – If you have a site that is heavy with images, make sure that they have alt tags. An alt tag is a description of what is in the image that screen readers will make their users aware of. Be concise about it, but descriptive. It’s easy to get lost in the details, but really what they want is to know what the image is of. 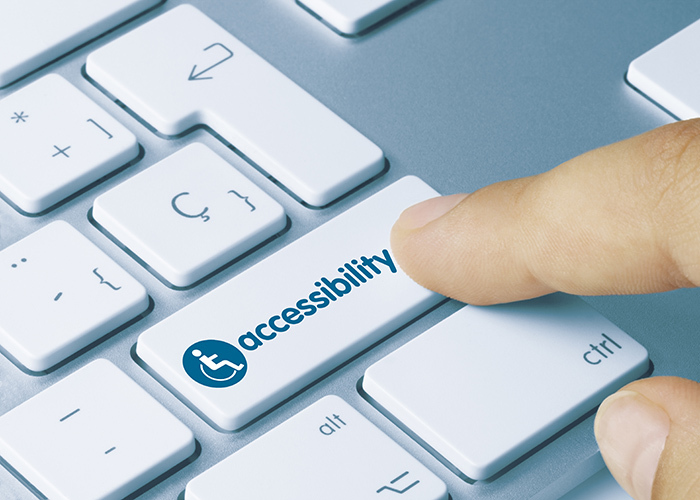 For instance, the image used in this post reads “Finger pushing a computer keyboard button labeled accessibility.” Knowing what the keyboard buttons are white, the text is blue and there’s a wheelchair icon on it doesn’t help with telling them what the image is portraying. It’s almost too much information to give them that. Stop Using ‘Click Here’ – Depending on the settings that someone has set up, a screen reader will list out all the links that a web page has. That means that if all your hyperlinks are labeled ‘Click Here’ and you have 8 of them, what a user is going to get is that there are 8 links and they all go to ‘Click Here.’ It’s best to work a hyperlink into your text naturally and make sure that the text for the link tells them exactly where they are going or what kind of information they can expect there. Don’t Just Use Color – If you have your site set up to only indicate a link in color add another attribute. For folks who have color issues, the color may not translate. Allow the normal underscore to come through, have the text change color if they mouse over it, but give them something else that indicates those words do something. Write Your Content Like a Book – Use the header tags when you write. That gives the screen reader an idea of hierarchy. Try to Write Plain Text Style – If you’re like me you like big words. Although screen readers are advanced, they don’t always catch the big words easily so write for your lowest common denominator. It may feel like you’re writing in too basic a manner, but it will help. Words Shouldn’t Be Images – If you are using images for your headers on as your links, stop. Screen readers don’t recognize it as text and so users are going to miss some pretty important guidance. Watch Your Color Scheme – Contrast is a huge deal with it comes to vision. If your background is blue, make sure the text that appears on it is in a color that can be easily readable. Your scheme may look pretty, but is it functional? Learn – No seriously. Watch videos, read articles and find resources. Discuss – Do you know anyone in your life that is hard of hearing/deaf or someone who is blind/vision impaired? Ask them if they’re willing to talk about how the world could best help them get around, and then (and this is important) WAIT FOR THEM TO OPEN THE DIALOG. Don’t hound them. If they don’t want to talk to about it, they don’t have to. Good allies don’t make their allies uncomfortable. Because here’s the thing: I am an able-bodied seeing and hearing woman who, although bi-racial, most people identify as white from the moment they see her. I could put on noise-canceling headphones or cover my eyes and use a screen reader but I am never going to be able to replicate what they go through. Why? Because I can go back to being me and I’ve been working with the content for a while. Follow This Blog – I’ll be honest, this site isn’t accessible, but I’m going to work to make it so it is and I’ll be recording how my efforts are going not just with this site but with others. How I came to start advocating for this, and why I’ve started my ally journey is that my 9-5 workplace works closely with a state government agency and I had to convert as much as I could of an existing site we had to ADA compliance. The breadth and depth of the work are staggering, and I’m nowhere near close to done. It also became clear that it had to become an environmental mindset and not just a task. I’m an ally work in progress and I’m going to share how that goes here. Accessibility is important. Right now we live in a time where there is a lot of division. If we can start finding ways to include those who should never be excluded, isn’t it just right to do it?